Canada's starting props on Saturday, in the muck at MacDonald! Was Wednesday’s blog timely or not? Cancellation of games this weekend is looming large, due to fields being closed! Received a lengthy response from Bruce Kuklinski in regards to the blog. Bruce serves as Lower Island Middle Schools Rugby Commissioner. He points out that in fact, in Victoria over the past seven years, numbers of Grade 8 students playing the game have increased by 40. I would also add to that stat, the fact that annually, for some 42 years, Greater Victoria Elementary Schools introduce between 2 – 300 girls and boys in Grades 4 & 5 (6 & 7 before reconfiguration of schools), to Mini Rugby during the months of March – May. Their play culminates in a giant Jamboree Day with schools from Vancouver to Sidney and Sooke participating. So, why don’t those numbers show up in BCRU stats? 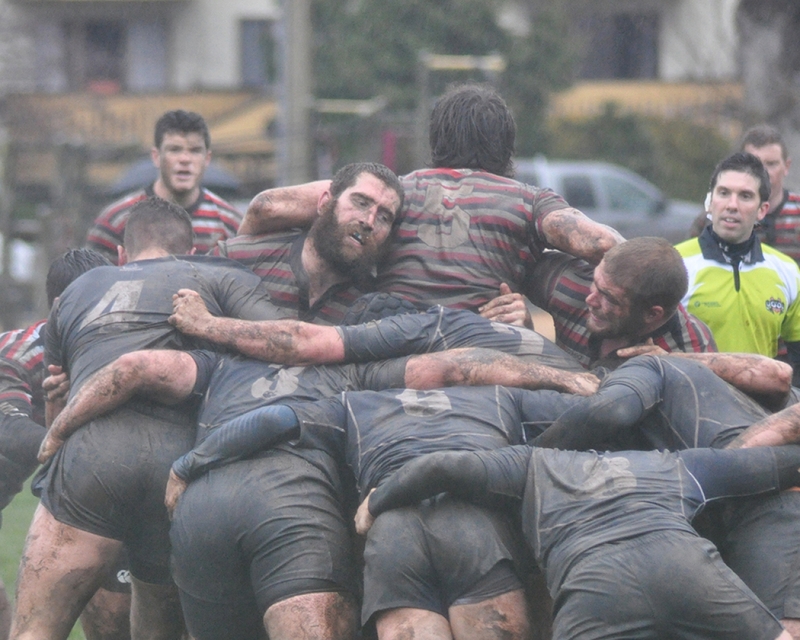 To the point of the blog – no club rugby is played at this time of year! I have personally handled as many as twenty requests following Jamboree Day as to, where can my child play rugby? Unfortunately, my answer has been; “mini and age grade rugby does not begin in Victoria until September." James Bay and CW distribute flyers to the kids but I would opine that from these large numbers playing at school in the spring, the clubs might add ten or so kids in September. I rest my case! Why wouldn’t a change of season date be considered? Convince me! Elsewhere, on this site there appears to be some links not working. Our host is working on correcting this problem and we apologise for the inconvenience. The content is posted but you may have to find it an alternate way. Try www.cwrugby.com Home page, “Latest News”, “Learn More” button. Remember to “Like” us on Facebook. Should Saturday’s games at MacDonald be a “go”, we will have news about teams tomorrow. Best of luck to NSMT 7’s in Hamilton (N.Z. ), this weekend. Canada is in a pool with U.S.A., Kenya and Samoa, no chopped liver any of these teams but chances for the taking. CW’s youngster, Josiah Morra and Canadian football’s newcomer and flyer, Tevaughn Campbell have scooted Downunder as replacements for the injured. We wish the boys well. The NSMT XV’s will be in Montevideo to face a monumental task against hosts, Uruguay. Braid and Hassler are out and O’Leary and Staller are in, otherwise the starting lineup remains the same. There are plenty of high hopes that the boys can get the job done and we want them to know the CW Family is behind them. It would be some tale to tell. Note from Chris: "Looking at our first weekend of competition in the new year, the big issue I am seeing from a playing/coaching/refereeing standpoint is space. Defenders are lining up in positions that aren’t allowing for the ball to be cleared from the base effectively. Please look through these examples from the weekend. Ignore the refereeing decisions, they have to deal with context and material effect in each situation." Hats off to Chris for this feedback, hopefully, helpng to make our game better.